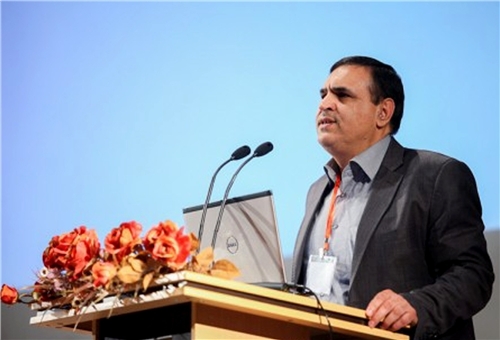 FNA – Secretary-General of the Iran Nanotechnology Initiative Council (INIC) Saeed Sarkar announced the country’s plans to boost exports of its home-made nano products. “We have planned to export nano products to 49 states,” Sarkar told reporters on the sidelines of the 11th International Nanotechnology Festival and Exhibition (Iran Nano 2018) on Saturday. He added that Iran has exported nano products worth $62.4mln to foreign countries in the past Iranian year (ended on March 20). The 11th International Nanotechnology Festival and Exhibition (Iran Nano 2018) kicked off at the Tehran International Exhibition Center on Saturday. The reputable trade show is organized by Iran Nanotechnology Initiative Council (INIC) and this edition of the exhibition will come to an end on October 16. The International Nanotechnology Festival and Exhibition is a four-day event showcasing products related to water and environment, energy, healthcare, automotive, construction, textile, petroleum, agriculture and packaging and other fields in the IT and technology industry. During this year’s run of the event, 33 industrial projects together with six winners of the nano challenge program will be put on display at the industry and marketing workshop stand. According to Sarkar, delegations from South Korea, Malaysia, Indonesia, Russia, Ecuador, Armenia and Oman are taking part in the exhibition. Countries such as Armenia, Oman and Korea have their stands at the exhibition, showcasing their nanotechnology products to visitors.